In this blog, I will introduce BPC and SAC integration solution. BPC is the strategic planning solution in on-premise area and SAC is the strategic planning in Cloud area. Hence hybrid solution of SAC and BPC is combination of two best worlds. The BPC to SAC import/export was developed to have a smooth way to replicate Financial planning models or parts of them to SAC. BPC plays the role of corporate planning and SAC plays the role of line-of-business (LOB) planning. These financial planning models are typically not that huge in BPC. To prepare import/export workflow, IT should setup the connection in SAC. 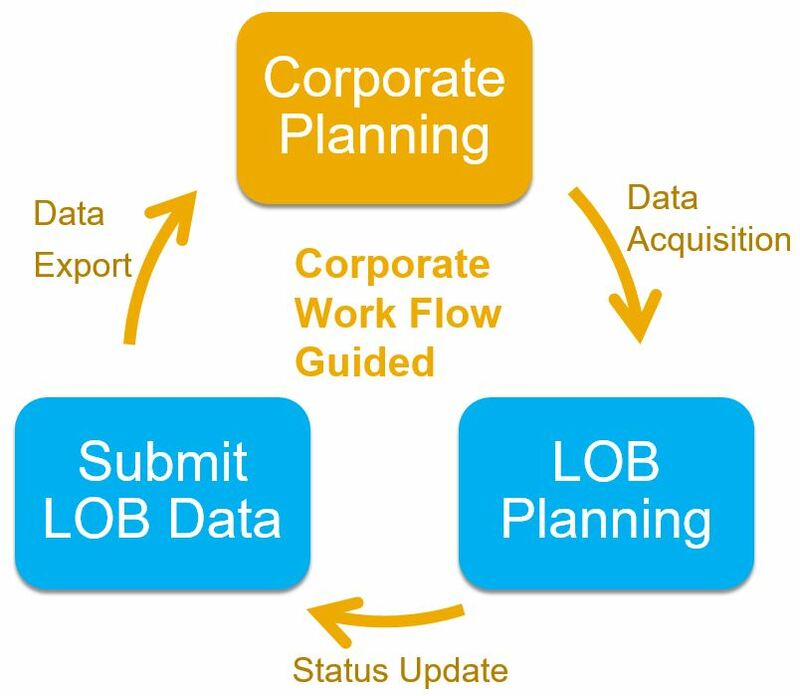 LOB acquires Corporate planning target data. The data acquired is usually part of corporate planning data via filtering in import process. You can setup a schedule to do the import from BPC model to SAC model on a regular basis. LOB does planning process internally. LOB can add more master data for local planning purpose. SAC advanced planning capabilities(spreading, allocation, powerful table, version management…) could be fully leveraged. Please note only the fact data is imported to SAC. The calculated data from member formula is not imported. LOB submits its final planning data back to corporate. The planning functionalities in BPC can be leveraged, such as script logic. A writeback model is introduced for semi-live integration between BPC and SAC. In order to have semi-live integration, the master data should be consistent between SAC and BPC. All master data(except formula attribute) will be read-only in SAC since they should be synced from BPC. Data Lock and Input Task are NOT supported in writeback model. Right after SAC user publishes the data from story to BPC, SAC will retrieve the latest transaction data from BPC, and the calculated data generated by BPC member formula will be retrieved along with the non-calculated data by default. Depending on the filter range defined for the BPC writeback model, the volume of fact data generated by BPC member formula can be large and the calculated data retrieval process can be performance concerned. Alternatively, if the SAC user does not want the calculated data generated by BPC member formula to be involved during data refresh, there’s an IMG parameter named with “SKIP_GET_FORMULA_DATA” on BPC side. The parameter is on BPC model level. The BPC administration user may go to transaction SIMGH to add the parameter to corresponding BPC model and set the value of parameter as “X”. After the parameter has been set, BPC will not return the calculated data in SAC writeback scenario. Member length of Currency dimension is 3 in SAC, hence the members with more than 3 characters are truncated. Attribute length is 127 in SAC, hence the attributes with more than 127 characters are truncated. SAC time dimension supports 12 months, hence the months other than 12 months are ignored. Data access profile can’t be replicated automatically from BPC to SAC.The data access profile is designed differently in BPC and SAC, hence it’s not feasible to replicate data access profile. BPC DAP can be set via hierarchy formula, member filter and attribute filter. SAC DAP currently can be set via member filter. Apart from it, it’s technical challenge to get the SAC users from BPC users to assign data access profile to users. Member formula can’t be replicated automatically from BPC to SAC. Member formula has different syntax in BPC and SAC. It’s not feasible to convert the member formula from BPC to SAC. The BPC formulas that produced the calculated members are imported into an unused FORMULA column of the account dimension. You must recreate the formulas in the proper syntax for SAP Analytics Cloud in the Formula column. Calculations defined in EPM plugin in AO can’t be replicated to SAC. Script Logic can’t be replicated. The Script Logic in BPC and Advanced Formula in SAC can be used separately in the planning process. BPC and SAC integration is targeted to replicate planning model, whose data volume is usually not huge. Detailed data could be aggregated in BPC and replicated to SAC to avoid mass data in import/export to gain a better performance. Replicating data on-demand instead full data from BPC to SAC via filtering in import process to gain a better performance. Import BPC YTD model to SAC (period storage) . Converting from YTD to Periodic is quite time-consuming. And BPC YTD model is usually used as Consolidation model, which is not planning scenario. In rare case that BPC YTD model has to be imported to SAC model, and user would like to see YTD data in SAC story, he/she could create restricted measure with YTD value. Large amount of transaction/master data is not recommended for the time being. The data volume supported depends on memory setting in BPC system and transaction data distribution. The more equally transaction data is distributed on master data, the larger data volume supported. There is a plan to improve the scalability. To my mind the process is not as simple as described in the article. In the real life LOB use a lot of additional calculations in Excel files to generate forecast figures. And additional calculations can’t be reproduced in SAC. For your information, I recommend you to have a look at the latest and greatest features of SAC in the last 2-3 waves…especially around Excel-like calculations that could be dynamically part of a table… as well as usage of Analysis for Office 2.7 on top of SAC planning models… This would be very useful in your context. I am talking about practical approach: you have some complex business process with many steps and conditions and you want to somehow plan the finance result. Currently you create a process model in Excel, using all Excel features to provide flexible calculations. LOB users will receive Excel template with number of cells marked to enter model parameters. After entering data finance figures are calculated using Excel formulas and LOB user can see resulting figures immediately. Then the user can push the button in Excel with EPM/AO to save results in BPC standard model. You can use Analysis for Office with SAC now. Including data input. Not sure, will try it out and come back to you on that. Hi Vadim, sorry for the delay in responding to you. I tested and we can use native excel formulas as well as keep the formulas when saving or refreshing the workbook. However, there are limitations and downsides in comparison with the old and good EPM Add-in, such as lack of Local members – if the workbook is dynamic in terms of the number of rows or columns, from what I could see formulas would need to be either updated manually or using VBA (similar to what was done in old 7.5). To be able to work with formulas, you need to use the button “Convert to Formulas” in AO ribbon. Although I still don’t understand why SAP’s preference for AO, given that EPM Add-in is way more friendly and flexible in comparison to AO – this integration is a good option for SAC. Import BPC data to SAC on regular basis for BI purpose. One of the biggest business case in using SAC as a BPC client is actually, to leverage the analytics capabilities of SAC. SAC/BPC Standard model integration is not positioned for analytics purpose which has different requirements comparing with corporate/LoB planning scenario. For example Analytics case requires that import supports huge data volume incl. actual data in detailed level. SAC as BPC client is more talking about live connectivity to BPC. There is no plan for live connectivity to BPC standard model. Our strategy for BPC standard model is to migrate BPC standard model to SAC model in the long run. Not sure if I understood your point about not being able to use SAC Bi capabilities for BPC Plan data – after all, actual vs plan is an ordinary requirement in 11 out of 10 business cases. Planning data volumes are usually way smaller than actual data, so the volume constraint shouldn’t be relevant in this case unless we’re talking about very specific cases such as SO&P data integrated from IBP or APO. Have you got any specific numbers about this constraint?